When we carved our Jack-o-Lanterns for Halloween, I decided to experiment with various ways of preparing pumpkin seeds. Here's what I discovered in the process. 1. 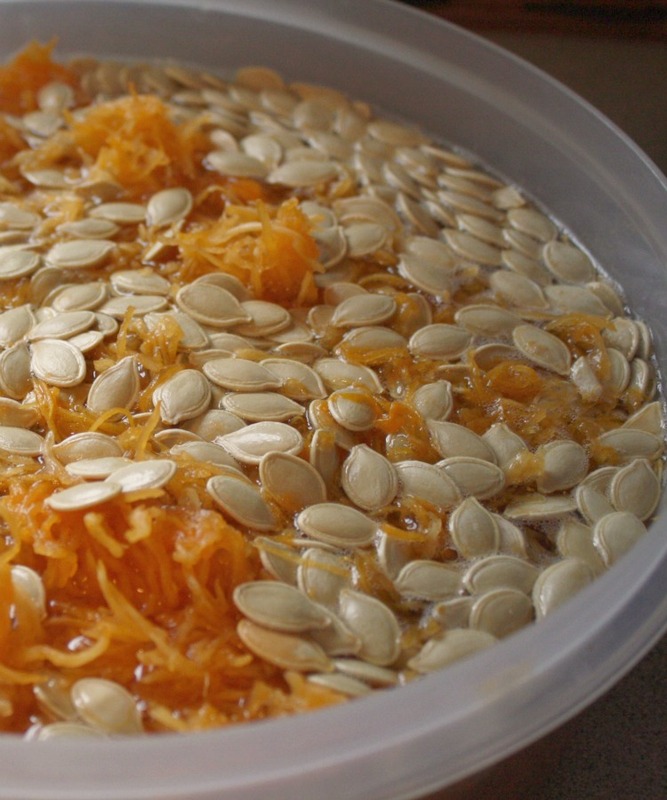 Water makes it easier to separate the seeds from the pulp. I tried Alton Brown's technique of putting the scooped-out mess in water to help separate the seeds from the pulp. It worked well. The seeds float, so you can skim them off with a slotted spoon (or small strainer, as Alton does). Some seeds do remain stuck to the pulp, so you have to stick your hands in the goo and separate them, but they come off easily. Alton does all of this in a sink. 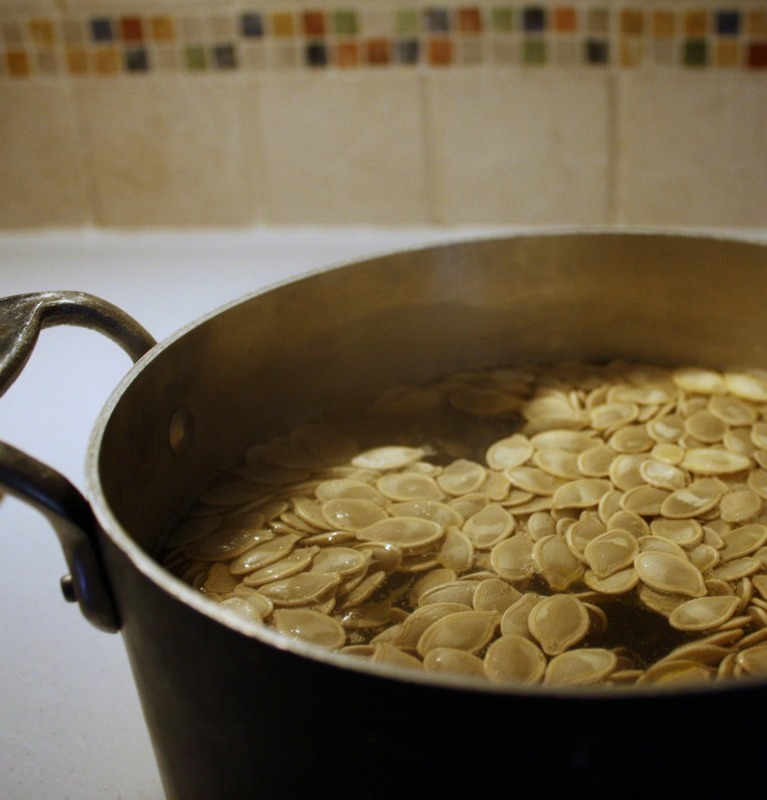 I wasn't sure what any errant pumpkin seeds would do to my garbage disposal, so I did mine in a big bowl. When I was done, I dumped it all in a strainer. I let the water go down the drain, then threw the stuff left in the strainer into the garbage. 2. Drying the seeds on a paper towel is not a good idea. In the video above, Alton Brown called for spreading the seeds out on a paper towel and letting them dry overnight. When I tried this, the seeds stuck to the paper towels. I spent a few minutes trying to pick bits of paper towels off the seeds, then wound up tossing that bunch of seeds in the trash. In my experience, a quicker and easier way of drying them is to put them on a greased cookie sheet and bake for an hour at 200 degrees. 3. Boiling the seeds: jury is out. I've seen a few recipes, including this one, that called for boiling seeds in salty water. I liked this idea because I thought the flavor could permeate the seeds instead of resting on the outside. I tried this twice and I'm not sure it made a significant difference in flavor or texture. My sense is that the water would have to be saltier than the 1/2 Tablespoon for every 2 cups called for in the linked recipe so I quadrupled it in the next batch. I've heard of people soaking the seeds overnight in various solutions ranging from salty water to liquor. All are worth exploring. 4. Low and slow is the way to go. The 400-degree, 10-minute baking time in this recipe seems speedy and convenient, but it didn't result in a tasty pumpkin seed. I think that most people would agree that the color of the pumpkin seeds to the left doesn't look anywhere near overdone. When my 15-year-old son tasted them, however, he remarked that they tasted like "burnt toast" -- which was an apt description. My final try was a combination of boiling them in water, combined with my tried and true recipe. That fared the best, although I'm not convinced boiling them in the water made a big difference. The final recipe is at the end of this post. 5. Snack Jack seeds are still the best. Although the Jack-o-Lantern seeds weren't bad, they still had a chewy, fibrous texture I found unappealing (although my 15-year-old thought they were great and ate the whole bowl). 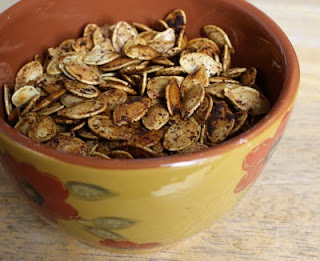 If I was to make the ultimate pumpkin seeds, I'd get some Snack Jacks and follow the directions in this post. 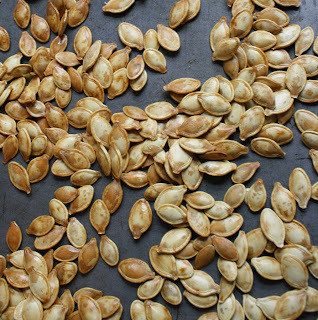 For Jack-O-Lantern seeds, the following recipe is the best -- so far. 1 Preheat oven to 200°F. Cut open your pumpkins and scoop out the insides. Put the whole mess in a large bowl of water. Skim the seeds floating in the water with a small sieve or slotted spoon. 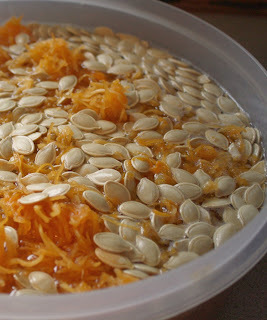 Separate the rest of the seeds from the stringy orange stuff. Discard the orange stuff. 2 (Optional:) In a saucepan, add the seeds to 4 cups of water. Add 4 Tablespoons of salt. Bring to a boil. Let simmer for 10 minutes. Remove from heat and drain. 3 Spray a couple of baking sheets with cooking spray, and spread the seeds on the pans. Bake at 200 degrees for about an hour. 4 In a small bowl, mix together 1 tablespoon canola oil, 2 teaspoons Worcestershire and 2 teaspoons Cajun seasoning. Pour over seeds and stir to combine. Bake at 275 for another hour. 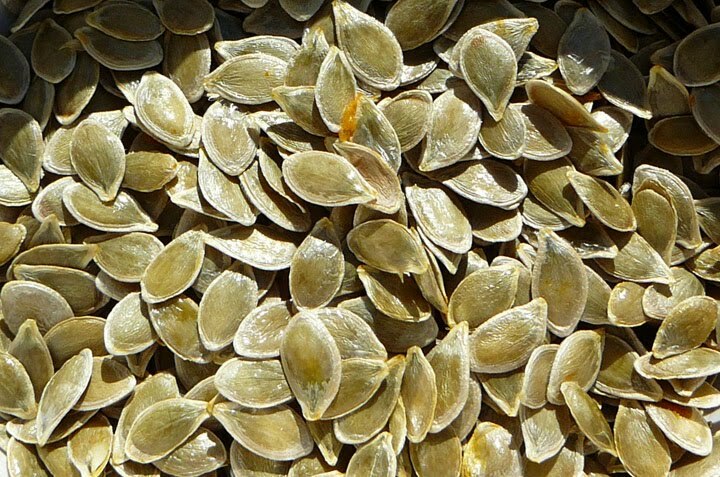 We used to just add a little salt to the seeds before baking. But my husband loves anything with heat - so I'll bet he'll munch on more of them with Cajun seasonings. And, pumpkin seeds are really good for men's prostate health. Just one of those good things to know. 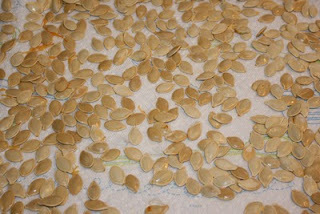 Very informative...I did pumkin seeds this year to...I will be posting a blog post about this shortly..a strainer worked well for me! My husband loves roasted pumpkin seeds but since I bought some real looking foam pumpkins a couple of years ago, there hasn't been much roasing around here. Poor guy, he'd love to be at your house for these. Oh well, maybe next year!